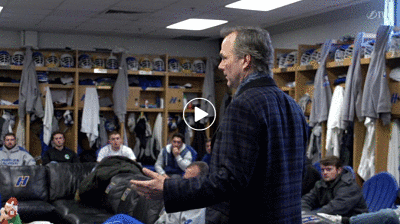 Tampa Bay Lightning Head Coach Jon Cooper Visits His Hofstra Lacrosse Roots! Note: I came across this via email from NHL.Com, sent the link by Tony Collette. Thanks to Tony for sharing this! The video shows Coach Cooper giving a talk to the Hofstra Lacrosse team last week, probably while the Lightning were at Nassau Coliseum to play the NY Islanders. For those not familiar with the geography or the back story, Hofstra University is basically across the street from the Nassau Coliseum in Nassau County (I grew up about 10 minutes away) and Jon Cooper was a pretty darn good starting middie for Hofstra before getting into coaching professional hockey. He put up 99 points in his career and played for then Hofstra HC John Danowski.